Email spam is bad, but blog spam is even worse. When a junk message arrives in your inbox, only you see it; when a junk message gets posted to your blog, anyone who visits can see it. Spammers use automated programs to post comments on blogs, partly to attract people to their sites, but mostly to improve their rankings in search engines like Google. Comment spam was so frustrating, and stopping it so elusive that I turned off comments for a year. When a new version of MovableType came out that offered better spam protection, I turned comments back on. The filtering worked, and it was good. And if anything, the spammers are speeding up. 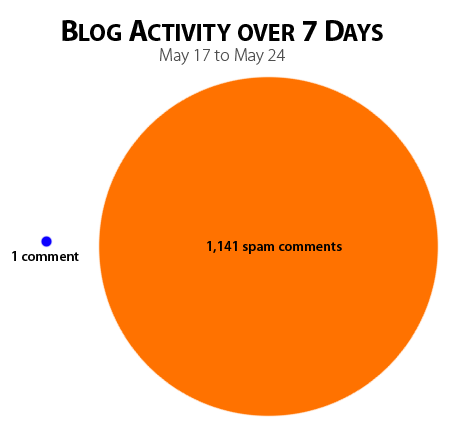 In three years, I’ve received 17,431 spam comments, which is about 100 a week on average. In the last seven days there were over a thousand. What to do? First, I resolved not to turn off comments again. I have slowly but surely begun attracting feedback; I don’t want to squash what little progress I have made by eliminating feedback completely. There are services that make readers sign up for an account to comment, but the associated overhead for my readers is enough to discourage activity. My default spam filters were catching 97% of junk comments, which is pretty good, but the extra 3% meant that five or six comments showed up on my site each day, most of which were X-rated. I don’t have daily access to the internet, so often comments accumulated and remained on the site for days. While 97% may be an A in school, it’s not good enough in this case. I thought I could add some observations to get my spam filters back on-track for near 100% accuracy. I went wading in the spam pool to see what I could find in the comments that were slipping through. Here are some samples. This was a step in the right direction, but junk comments kept trickling in even with my additions. Spam protection is an ongoing battle: once you’ve made some development to counter spammers’ tactics, spammers change them, and the race starts anew. I doubt that any spammer will read my blog and stop leaving “Great site!” comments, but certainly someday the content will change. Plus it’s a waste of my time to have to read through junk comments, trying to identify the newest common characteristics. This is ultimately why spam filters and blacklists aren’t the ideal approach. Paul Graham, a well-known programmer, explains the reasons in his seminal essay on spam protection and points to the new direction, which is spam protection based on Bayesian filtering. This means that automated systems have adaptive algorithms that continually re-evaluate what message characteristics correlate with being spam. Once a lot of people flag messages with the phrase “buy cialis” and many outgoing links, the system will learn that messages like these are likely to be spam. I signed up with Akismet, a free service that evaluates all my comments using this system and marks them as legit or spam. Since then, I haven’t received a single junk comment. As far as I can tell, no real comments have been accidentally marked as junk either. Do your worst, spammers. I’m ready. And to those real human beings who want to leave a comment like, “Totally awesome site!!! By the way, I have cheap phentermine that I’m unloading at bargain-basement prices….,” my apologies. Chances are your message will end up in my circular file cabinet. Awesome, um, anything but cite. I don’t know if I sent down the particular WIRED, but an article talked about how spammers are getting smarter and smarter in getting passed security. For instance, there was a big scam, where an emailer pretending to be pay-pal and said that the users account’s information was lost and needed them to enter in their personal information again. Totally radical sight, man! Want to buy some vie-agra? Seriously, I know the problem. I’ve had an unthinkable number of spam comments at LancesWorld, as well, to the point where I’ve turned off auto-posting of comments and approve them manually. I’m not quite at the thousands of spam comments per week mark, so the manual method is still manageable. By the way, a coworker of mine fell victim to a scam similar to the one Michael mentioned. He received an e-mail from “Bank of America” saying that his account had to be verified. Interestingly, my coworker said to himself, “I didn’t know they had this e-mail address,” and then proceeded to fill in all of the info anyway. Within 5 minutes nearly $10,000 had been charged to his account. Thankfully he caught it after I pointed out the complete idiocy of his ways. Some people are so gullible.